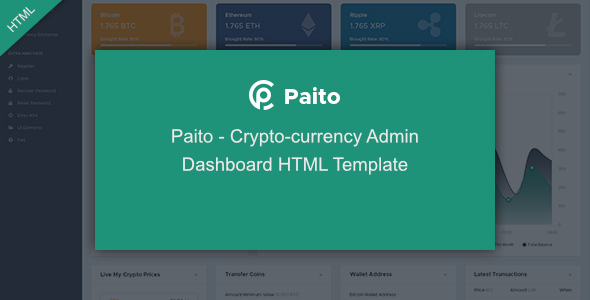 Paito – Crypto-Currency Admin Dashboard HTML Template has been designed keeping in mind all types of crypto business, cryptocurrency startup, ICO business, Buy and Sell Cryptocurrencies,crypto trading, bitcoin exchange, crypto marketcap, crypto watcher, ICO developers and etc.You can create subtle and striking crypto-currency based admin panels with our HTML version. .Paito is based on a simple and modular design, which allows it to be easily customized.It comes with lots of reusable and beautiful UI elements, widgets and more features. This is the ideal template for your next Crypto-Currency Admin Dashboard project. .
images in the preview are NOT in the download.